As I sat down to write this column, Hurricane Irma had pummeled the northeast Caribbean and was making landfall on the west coast of Florida. This storm comes after an 8.1 earthquake off the shore of Mexico on Thursday, Sept. 7 that killed dozens, and as devastating wildfires continue to rage in the western United States and Canada (the smoky haze over Minnesota originated in British Columbia). And all these disasters are occurring as Houston barely begins its recovery from the record setting rains of Hurricane Harvey. We can argue whether these events are natural disasters or human-made ones influenced by climate change and mismanagement, or a combination of both. These debates are important, but we are still left with the human toll these disasters take on people. We include ourselves in that toll when we watch them unfold. What can we do to manage our stress and well-being during these fearsome times? After a bout with cancer four years ago, I found myself with symptoms of Post-Traumatic Stress Disorder (PTSD). This was unexpected, but not surprising because as many as 1 in 3 cancer patients suffers from PTSD. My symptoms were classic: nightmares, anxiety, fear, and hypervigilance — waiting for the next shoe to fall. I learned all I could about PTSD and took steps to help myself manage the symptoms. 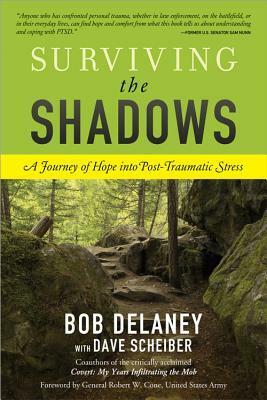 One book in particular helped me: Surviving the Shadows: A Journey of Hope into Post-Traumatic Stress by Bob Delaney with Dave Scheiber. While telling the stories of people who experience PTSD due to war, terrorist attacks, and other life-changing events, the authors also describe the specifics of PTSD, evidence-based approaches to addressing it, and hope-filled stories of recovery. Thanks to this book and many other excellent resources, I recovered from PTSD and only rarely now experience stress associated with my cancer experience. This book may help if you or a loved one is suffering from symptoms of PSTD, or if you want to better understand what survivors of disaster may be going through. I’d like to highlight two opportunities that can help you in your work to better manage during these fearsome times. I recognize that in addition to the recent environmental disasters, major political events are deeply impacting many of you. These events can paralyze us and make it difficult to move forward. My hope is that these opportunities will support and mobilize you. Over the next nine months, the Extension Center for Family Development is providing FD employees an opportunity to participate in Mindfulness at Work, an online program offered by the University of Minnesota Earl E. Bakken Center for Spirituality & Healing. More about the Center for Spirituality & Healing's mindfulness course. In October, the first cohort of 50 employees will participate. I have asked all those who supervise in the center and one or two from their staff to sign up for the course. If you are not participating in the first cohort, please know that all FD employees will have an opportunity to participate before the end of June 2018. Please contact your supervisor to indicate your interest in this course (participation is voluntary). You can learn more about the course by attending a webinar at 8:30 a.m. on Thursday, September 28. More details are available on the FD intranet: Family Development-Wide Training Opportunities (U of M login required). The second opportunity takes the form of a free, virtual conference sponsored by Military Family Life Network (MFLN) that starts two weeks from today. Although the conference is sponsored by MFLN, it is designed for all of us professionals who experience change in our work and organizations. How do we respond to change as individuals, and what do these responses mean for our professional selves? How can we nurture our own professional development in times of uncertainty? How can we lead effectively through change? What is the impact of an intergenerational workforce on change management? As I finished drafting this column while watching coverage of Hurricane Irma, I saw a shining example of managing stress and well-being in fearsome times. On a beach in Naples, FL, an adult dolphin and a baby dolphin were stranded on the beach after the storm surge. A group of eight residents and tourists carefully carried them back to the ocean. These residents were taking a small step toward recovery by taking their time and energy to help these dolphins. All likely had storm damage to their property, but fostered their personal recovery through this compassionate act. What small steps can you take to manage during these fearsome times? I have shared three ideas: a book to read, a course to participate in, and a conference on change. What ideas do you have for me and your colleagues?